Ohio Garage Interiors employs some of the best expert garage designers in Ohio. They offer a myriad of services to transform your garage into a beautiful extension of your home. With their cabinets, epoxy floor coatings, garage rack systems, and other products, the possibilities are endless. Ohio Garage Interiors can adapt to any customer’s needs. Regardless of your garage space or your personal, stylistic tastes, their team of garage designers are more than capable of creating the garage of your dreams. As one of the leading garage designers in Ohio, Ohio Garage Interiors has earned a reputation for quality and reliability. Their products are durable, function, and long-lasting; furthermore, they offer an unparalleled aesthetic upgrade for any Ohio garage. Easy to Clean and Maintain: Ohio Garage Interior’s finishing process leaves behind enough texture to prevent slipperiness and is completely non-porous, protecting against moisture. Their coatings are also super easy to clean, requiring only a simple spray from a hose. Withstands Ohio’s Weather: Ohio weather is particularly turbulent; thus, Ohio Garage Interiors has employed a polyaspartic polymer to protect their coatings from moisture and salt exposure. Their floor coatings can maintain their aesthetic for up to fifteen years under Ohio conditions. Backed by Local Company: Customers should always know exactly who they are working with, which is why Ohio Garage Interiors never uses subcontractors to complete projects. They are an entirely locally owned and operated company. Straight-forward Pricing: Ohio Garage Interiors refuses to trick their customers with bait-and-switch pricing. They will always send an expert garage designer to your home to give a quote at no cost. 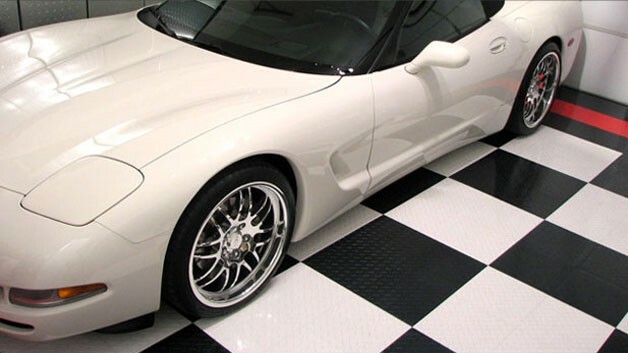 In addition to durable floor coatings, the garage designers of Ohio Garage Interiors are also masters of organization. They offer incredibly efficient garage rack systems and shelving to improve your garage space. This overhead garage rack allows for customers to maximize their garage space. Ohio Garage Interiors offers a multitude of garage rack and shelving options. You can finally store the things in your garage that take up far too much space. Furthermore, seasonal items like holiday storage boxes and lawn furniture are also easy to store. This storage system works great inside of cabinets and over workbenches and is also capable of storing nearly anything in your garage: bikes, ladders, sports equipment, gardening supplies, etc. This garage storage system is an all-steel rail system, which hangs a variety of belongings. The only part that is attached to the wall is the rail track itself; the rest of the hooks and accessories do not require power tools. The many hooks and accessories offered by Ohio Garage Interiors allow customers to completely diversify their storage space without any hassle. ADVAN Design is a digital marketing firm working with small to mid-size, Northeast Ohio businesses. We work to harness the marketing potential of our clients and use it to their advantage. Ohio Garage Interiors is a valued client of ADVAN Design; thus, they receive a large selection of benefits from our SEO packages and digital marketing strategies. We design our digital marketing strategies to increase visibility on Google Searches and enhance activity on social media platforms such as Facebook, Twitter, Pinterest, and more! If you are looking for expert garage designers in your area, consider Ohio Garage Interiors. They can redesign garage exactly to your liking. Learn more on the ADVAN Design Blog or visit their website.